Preheat oven to 175 degrees Celsius. Line a 12 cup muffin pan with muffin papers. Sift the flour into a large bowl. Mix the oil and sugar, add beaten eggs, vanilla extract and lemon juice. Add the buttermilk and mix until just blended, do not over mix. Carefully fold in the poppy seeds. Fill muffin pans. Bake 20 minutes until golden on top. If you have your own lemons this recipe costs $1.85 to make, costing just 15 cents per muffin. If you must buy lemons it will cost between $2.05 and $2.25 to make, costing between 17 cents and 19 cents per muffin. To bring the cost down, use cupcake size papers, you'll get 24 cup cakes from this recipe bringing the cost down to between 7 cents and 10 cents per muffin. 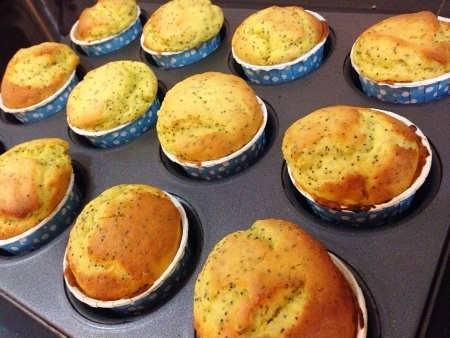 Olive oil can be used in this recipe, it gives a very moist muffin. Replace lemon juice with orange juice for orange poppy seed muffins. Can be iced with a lemon (or orange) cream cheese frosting if desired. Tania I wonder what they'd be like with mandarin instead of lemon - might be a tasty way to use up some of your mandarins :) I often use oranges instead of lemons, I seem to have more of them most of the time and they're good too. They are Karen, and they're cute in those little cardboard cups - Hannah found them at the Reject Shop ages ago and we've been busting to use them for something special :) I've had to limit the boys to one a day or they'd just disappear!